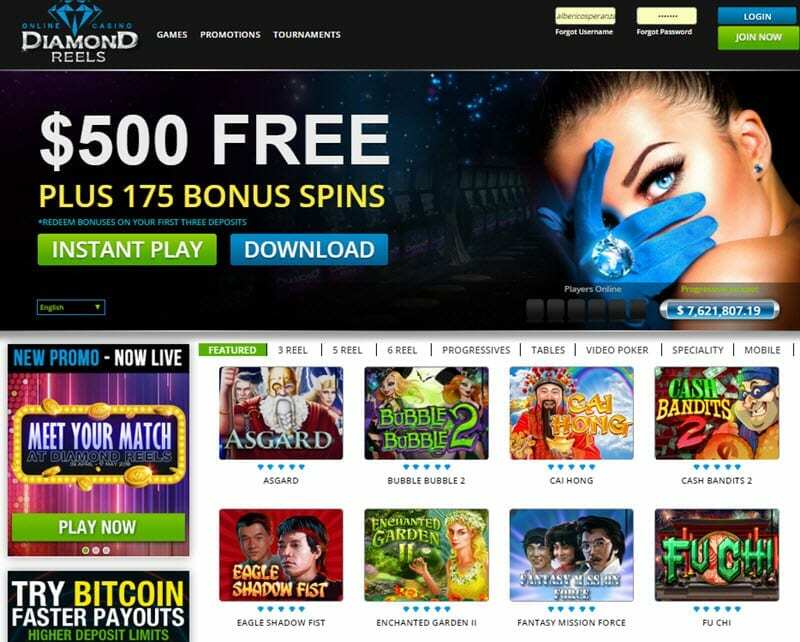 Diamond Reels Casino has been around for a few years, so it isn’t a newcomer to the world of online gambling. The casino obtained its license from Curacao’s government, which is a typical step for online casinos. 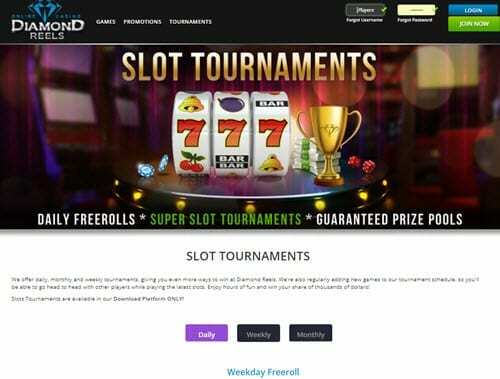 The website offers a classy appearance and provides access to lots of gambling excitement, including random jackpots and regular tournaments. Diamond Reels Casino is powered by Real Time Gaming (RTG), so you can expect exceptional graphics, reliable game play, and lots of speed. Since the site offers three versions of gaming, including mobile, instant play, and downloadable, you can access your favorite games from any location. 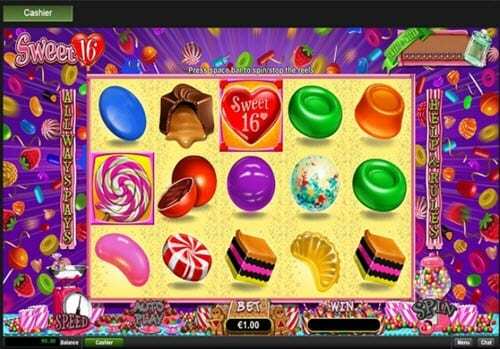 The selection of mobile games at Diamond Reels Casino is just as exciting as the ones available for desktops. Players who prefer mobile games can use tablets and smartphones since both types of devices are compatible with the software being used. As with many gambling sites, the collection of slots is important since most players wind up searching for their favorite games at any casino they join. The selection here doesn’t disappoint, and it does include familiar titles such as Aladdin’s Wishes, Achilles, Mystic Dragon, Count Spectacular, Ocean Oddities, and Pay Dirt. Of course, the collection of progressive slots is impressive as well, and it includes names that every gambler is probably aware of – Aztec’s Millions, Caribbean Draw Poker, and Caribbean Stud. Table games are just as easy to find and play. They include a range of blackjack games, baccarat, roulette, and poker. Specialty games can be found if you are interested in Keno, bingo, or Sic Bo. Video poker games aren’t to be left out of the mix, either, and they include all of the regulars such as Joker Poker, Bonus Poker, Aces and Eights, Jacks or Better, and All American Poker. Diamond Reels Casino delivers a generous welcome bonus for new members along with a VIP program that earns players new perks to enjoy. Boosting your ability to play is easy once you learn the ropes. 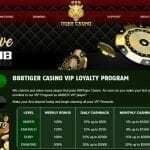 Rules and requirements are found on the casino’s website. The $500 Bonus Welcome package is available to all new members across their first three deposits. 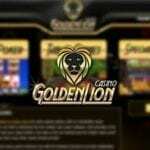 An initial deposit provides access to 150% match bonus along with 50 free spins. The second deposit earns access to an additional match bonus along with 50 free spins.The third deposit leads to a 200% match bonus and an additional 75 free spins. The fun at Diamond Reels Casino doesn’t stop with the welcome bonus either. Daily promotions continue the excitement with tiered match rewards that give players access to extra funds for game play. If you are looking for more excitement than playing against the odds, you can join one of the many slots tournaments held on the site. Lucrative wins are available seven days a week. Members enjoy earning comp points and tier benefits from the moment they join and place their initial wager. The VIP program includes four tiers – Club, Silver, Gold, and Diamond. VIP staff is ready to handle all of the details as you move from one tier to the next. Assistance is fast and easy to find since Diamond Reels Casino offers live chat, email([email protected]), and phone support 24 hours a day throughout the entire week. Plus, the phone line is toll-free (USA: 1 866 311 6263). The site uses SSL encryption to create secure transactions for its customers from the moment they register on the site. All sensitive banking and personal information is securely encrypted, preventing it from being stolen by hackers. Ensuring games are fair is an important part of an online casino. Diamond Reels Casino conducts an independent audit regularly to ensure all members have access to fairness in game play. A variety of methods is available for depositing and withdrawing funds, and SSL encryption keeps your money and information safe. 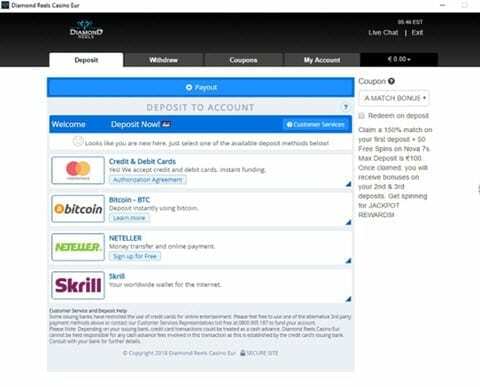 Deposits are easily made using bitcoin, Neteller, MasterCard, paysafecard, Skrill, Neosurf, CarteBleue, and Visa. Withdrawals are a bit more limited and must be made using bitcoin, bank wire transfers, Skrill, or Neteller. Unfortunately, Diamond Reels Casino is no different than other online casinos and has its own selection of countries and territories from which it does not accept members. These territories and countries include United Kingdom, Philippines, Australian, Chile, Denmark, Poland, Turkey, Japan,Chile, Finland, Mexico, South Africa, Netherlands and Antilles.